Dear Readers, in the spring the cemetery is positively awash with buttercups of all kinds. But by the autumn, only a few creeping buttercups are left, and are all the more precious for their rarity. In a whole raft of foliage in a clearing, there was just one solitary plant in flower. 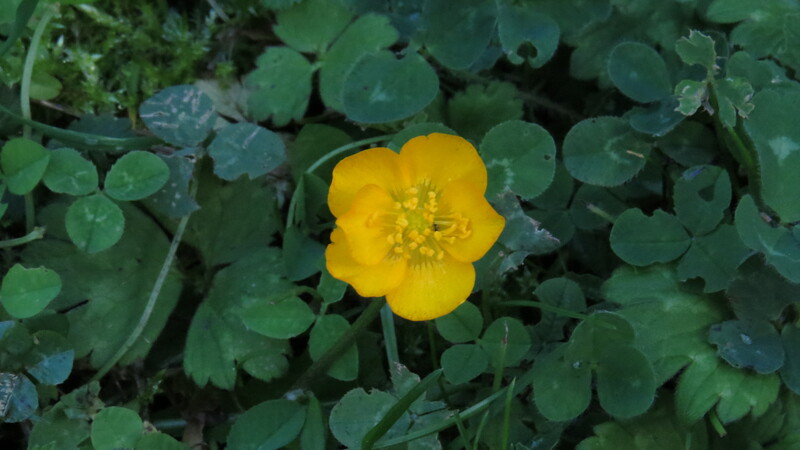 This is the only common species of buttercup that is likely to still be putting forth blooms in October, but to seal the identification it’s worth noting that the sepals (the green parts which once contained the bud) are spreading, and the stalk of the plant is grooved. 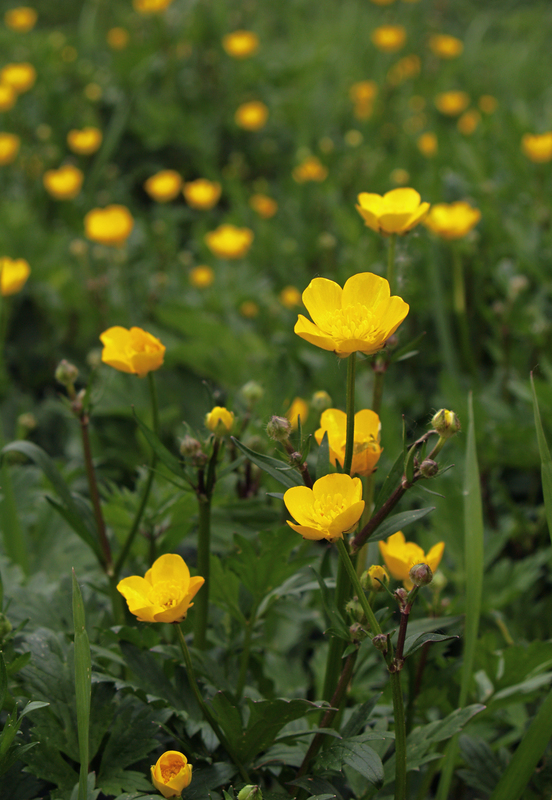 As its name suggests, creeping buttercup spreads by runners that root to form new plants. It prefers wet soil (Ranunculus means ‘little frog’) and my father taught me to be careful in areas with lots of buttercups if I wanted to avoid getting my feet wet. The plant is native in the UK and to the rest of Europe, North Africa and Asia, but has been spread to other parts of the world, often as an ornamental plant, and is now sometimes considered a nuisance. One of its vernacular names is ‘Sitfast’, and that’s exactly what it does. The Royal Horticultural Society website suggests various ways of getting rid of the plant, which is said to indicate a need to ‘improve soil structure’. 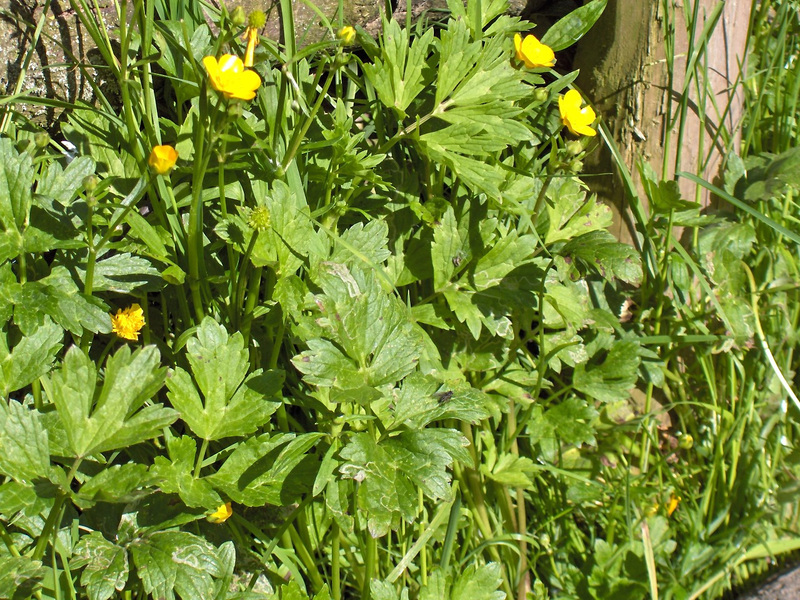 If you put the words ‘Creeping Buttercup’ into Google, the majority of the entries are on how to eradicate the plant from your land or garden, and the Garden Organic website has just one alternative name for the plant – ‘Devil’. On the other hand, I would have thought that it would have been a sunny addition to bog gardens and the damper places on a plot – I have a few around the pond, and rather like their bright little flowers, as do the smaller hoverflies, who are apparently attracted not just by the yellowness of the petals, but by their shininess too. 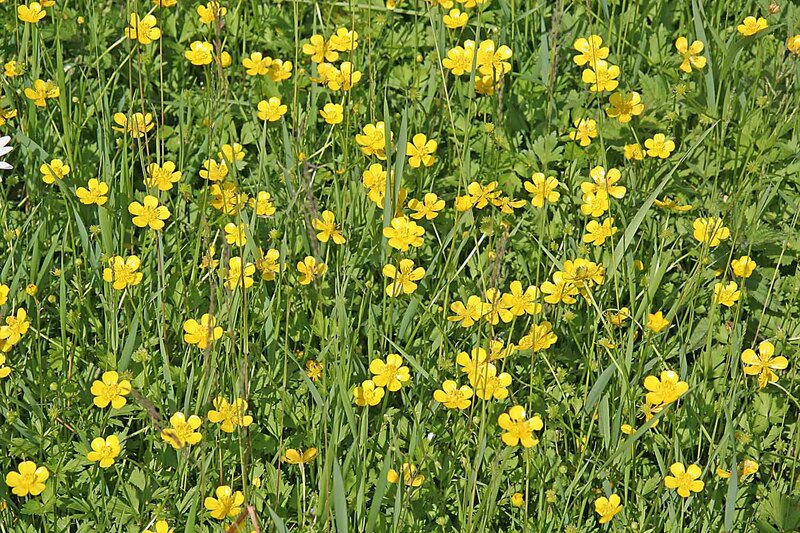 Like all Ranunculi, creeping buttercups are mildly poisonous.However, when the plant is crushed (for example by the teeth of an enthusiastic cow) one of its chemical compounds, Ranunculin, is changed to an acrid, unpleasant tasting yellow oil called Protoanemonin which is enough to deter the hungriest of grazers. The plant loses its toxicity when dried, so there is no hazard from hay. Lots of creatures eat the seeds, from house sparrows to earthworms, and rodents sometimes store them for winter consumption – no wonder this is a plant that appears everywhere! Partridges, wood pigeons and pheasants are also fond of the seed, which can survive a journey through the gut, and chickens and geese are said to enjoy the leaves. In short, this common plant helps to feed all kinds of animals. In spite of their toxicity and unpleasant taste. 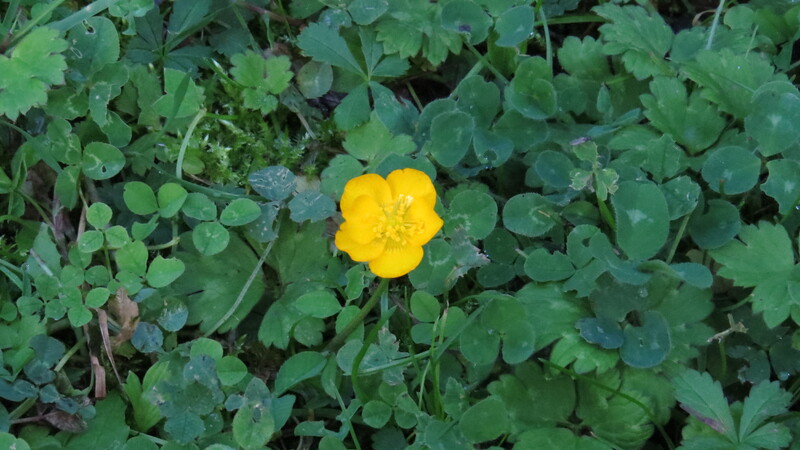 both the leaves and the boiled roots of creeping buttercup have been eaten by humans, though I imagine more as famine food than with any pleasure. The plant has also been used medicinally, in a poultice for rheumatism and in Ireland as a cure for jaundice (the yellow colour of the plant possibly suggesting its use). However, for most people the primary ‘use’ of any buttercup is for the childhood game of holding it under the chin to see ‘if you like butter’ – a yellow reflection indicating that you do. The ever-informative Eat The Weeds website features an explanation for why the flower always produces a yellow reflection: it relates to the structure of the cells in the epidermis of the petals, and of course is more to do with attracting pollinators than any dairy-related preferences. For all the details, see here and scroll down. However, the most prominent memory that I have around buttercups is a song by The Foundations called ‘Build Me Up Buttercup’, which was a hit in 1968. How I remember listening to Family Favourites on the radio, and singing along when this came on. My childhood (I was born in 1960) seems to have been punctuated by these cheery recordings: ‘Flowers in the Rain’ by The Move, ‘Waterloo Sunset’ by The Kinks, ‘Pretty Flamingo’ by Manfred Man. What a rush of nostalgia washes over me when I hear these songs now! And how interesting that all of them have a theme relating to the natural world. Perhaps I was indoctrinated by music at an early age. So, for your delectation, here are some of the sounds of my caterpillar years. I hope you enjoy them. This entry was posted in London Plants on October 26, 2016 by Bug Woman. wonderfully informative as ever, and great song reminders to boot! This multi-media posting is fun; how about finding a way to include scents and tastes, too? The music ‘took me back’ especially the Kinks, who lived in Muswell Hill. I am not going to click on any of those links – I have a fear of ‘ear-worms’! I adore the sight of Buttercups, they are always so cheerful. It is interesting that they are mildly toxic when fresh but not so in hay. I inadvertently listened to Radio 2 last week and still have the refrain of ‘Hot dog, jumping frog, Albuquerque’ running through my head.